General Motors insists it will sell 10,000 Chevrolet Volts in the U.S. by the end of this year, but as of now, the numbers don't look good. By the end of August, the last time GM publicly announced its sales, about 3,500 Volts had been sold. To reach 10,000, GM will need to average about 1,700 Volts per month for the last four months of the year. In August, GM sold 300 gasoline/electric Volts. Meanwhile, Nissan sold over 1,300 of its all-electric Nissan Leaf that month. In fact, the Leaf was the fourth best-selling of all alternative fuel vehicle that month, including hybrids and diesel cars, according to Intellichoice.com. September Volt sales will be revealed Monday when GM reports its monthly sales tally. Not to worry, GM spokesman Rob Peterson said. "I don't see any problem with reaching our goal," he said. The reason he gives is that GM's Detroit factory is still just clearing its throat. The real show starts now. Up to now, the Volt has been available for sale in only seven test markets including New York, California and GM's home state of Michigan. Even so, Volts have found homes in all 50 states including Alaska and Hawaii, said Peterson. Some people can't wait for them to be available in their own states. They want the cars so badly they're buying them and shipping them across oceans and continents. Now, GM is getting ready to sell the Volt at 2,600 Chevrolet dealers across all 50 states and getting geared up for that has meant drawing Volt sales down to a trickle, he said. First, GM closed the Detroit factory where the Volt is built for four weeks to upgrade it so it can turn out Volts faster. That extra production capacity was needed because, in addition to selling across the U.S., the Volt will also go on sale in Europe and Asia. In all, GM expects to sell 16,000 Volts by the end of this year, a figure that includes a Europe-only version called the Opel Ampera. Every one of them will be built in Detroit. Once production started again in mid-August, the first priority was getting so-called demo units to dealerships so they could demonstrate the products and give test drives. That left only about 300 cars to sell to customers in August, Peterson said. Bottom line, he said, GM is still selling every Volt it can build. It just needs to build more. The plant is capable of producing 600 Volts a week, Peterson said, or roughly 2,400 cars a month. 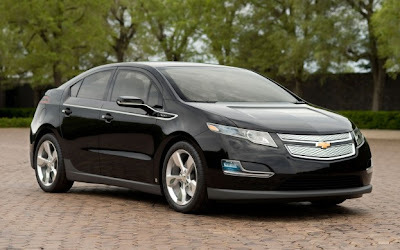 The Volt is eligible for a $7,500 federal tax credit, which brings its effective base price down to about $32,500. Also, it's available at a relatively low lease rate of about $350 a month. Phil Gott, an industry analyst with IHS Global Insight, agrees with Peterson that the Volt's current lagging sales status is no indication that demand for the car is flagging. Regardless of sales numbers, the Volt is already doing solid work for GM, Peterson said. "Of the initial batch of Volt owners, about half hadn't stepped into a Chevy dealership in eight years," he said. "A third never had." That means the Volt is drawing new customers into Chevrolet showrooms. "I've heard that some Chevy dealers are using the Volt to get people into showrooms and using it to sell the Cruze," said Omotoso. "It's almost half the price of the Volt and it gets great fuel economy." The Chevrolet Cruze also happens to be the best-selling compact car in America. So even if the Volt doesn't turn out to be a great seller, it seems to be a good salesman.